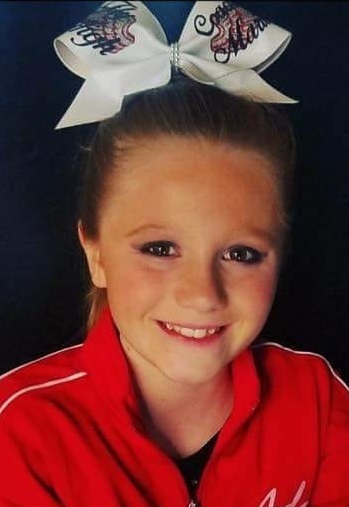 Addisen Renee Snyder, 11 year old daughter of Scott and Katie Snyder, gained her angel wings on September 25, 2018, with family at her side at Children's Mercy Hospital. Visitation will begin at 10:00 am, followed by a service celebrating Addi's life at 12 noon, on Saturday, October 6, at Pleasant Valley Baptist Church, 1600 N. State Route 291, Liberty. Burial will follow. In lieu of flowers, memorials are suggested to the Addisen Snyder Memorial Fund and may be left at the service or sent to Pony Express Bank, 215 N. State Route 291, Liberty, MO 64068. Addisen was born August 30, 2007, in North Kansas City, MO. She was a fifth grade student at Manor Hill Elementary School. Addi was a member of The Studio LDG Glee and Phoenix Cheer. Along with her mom and dad, Addisen leaves her brother, Lucas; grandparents, Rick and Joy Baldwin, and Judi Christian and husband Steve; great grandparents, Grace MacArthur, John and Virginia Snyder; as well as numerous aunts, uncles, cousins, other family members and many friends. I am sorry for your loss. Prayers for you all! Scott and Katie: Jeff and I are so Very saddened by your loss of your precious Addi. She touched so many lives, including ours. Her legacy carries on and you have got All of those precious memories of her to keep you going through out time. Your selfless act of making the decision to donate her organs will in itself comfort you knowing that her spirit and life is being carried on to help those in need.She is resting so peacefully up in the arms of Jesus and looking down on her family, mom, dad, little Lucas, grandparents and all others and I can see her saying " I am okay mom and dad and Lucas: I love you and it will all be okay". May God's blessings and arms keeps you safe and sound during this difficult time. Scott and Katie, its heartbreaking to know a child has been lost, but know she is an amazing girl that has saved so many people, she will always watch over you and guide you. Keep sharing her story and her love. My thoughts and prayers continue to be with you. Scott, Katie, and Lucas, My thoughts are with you during this most difficult time. You provided your Addisen with a fabulous family life. She was and will always be your first born, well-loved, beautiful daughter and sister. I am extremely sorry that your family has been altered due to Addisen's early passing and for the sorrow, you are experiencing. Fly high Addisen, until we all meet again. I know you’ll be your parents and brothers guardian angel through life, helping lead the way for them. You’ll be missed terribly. We are all praying for the family. Let me know if there is anything I can do to help.